"My goal is to show the art of jewelry in its true meaning. Design and craftsmanship should cost more than precious stones and metals." Paintings are not the only legacy of the world-famous artist Salvador Dali, the unique collection of gold jewelry, created in 1940-1970, is also a part of it. His muse and beloved Gala inspired Dali to create the collection of gold jewelry. The artist came up with incredible jewelry that surprises with its unusual design. The original jewelry of Salvador Dali gives the opportunity to "take a peak" at author's extraordinary thoughts. Golden jewelry, made according to his sketches, amazes with its extravagance and luxury. The history of the golden jewelry collection of Dali's authorship dates back to 1941. 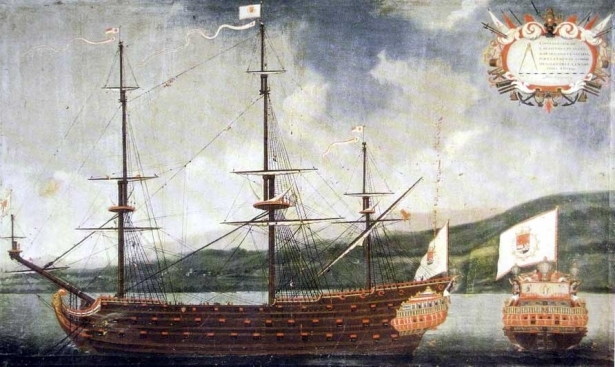 Over the next 30 years, the artist created 39 detailed paper sketches, working thoroughly on forms, details and colors. He personally selected precious stones and came up with names for the ornaments. New York jeweler Carlos Alemany embodied the surreal fantasies of the famous artist in gold. 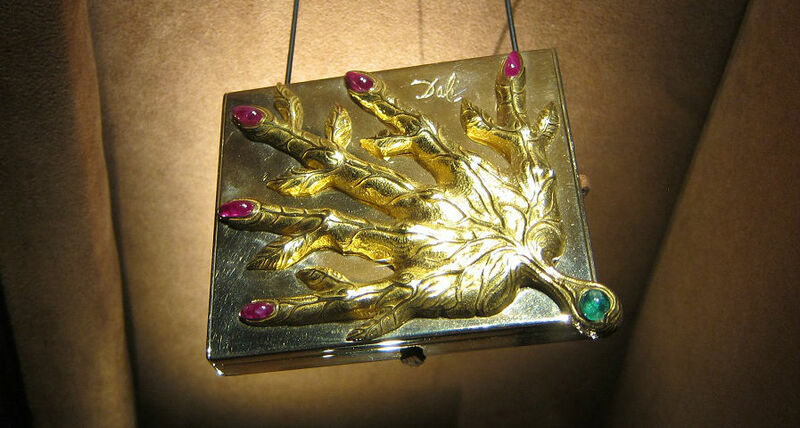 Salvador Dali wanted public to take his jewelry creations seriously. "These earrings, as well as all my jewelry, represent serious matters. The earrings represent the ear, which is a symbol of harmony and unity; encompassing the importance of modern means of communication – the danger of instantaneous exchange of thoughts." In the photo: "Telephone earrings" symbolize the importance of modern means of communication. 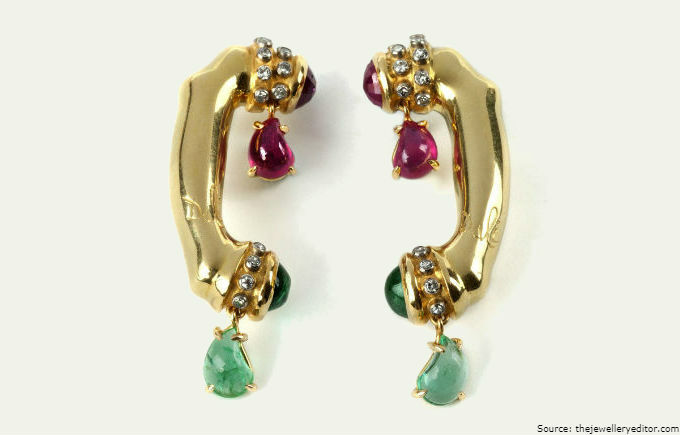 Materials used: 18K yellow gold, diamonds, rubies, emeralds. Made in: 1949. Tristan and Iseult are the heroes of the chivalresque medieval novel of the 12th century. These two lovers represent an eternal love of Dali and his muse Gala, a love beyond life's circumstances. 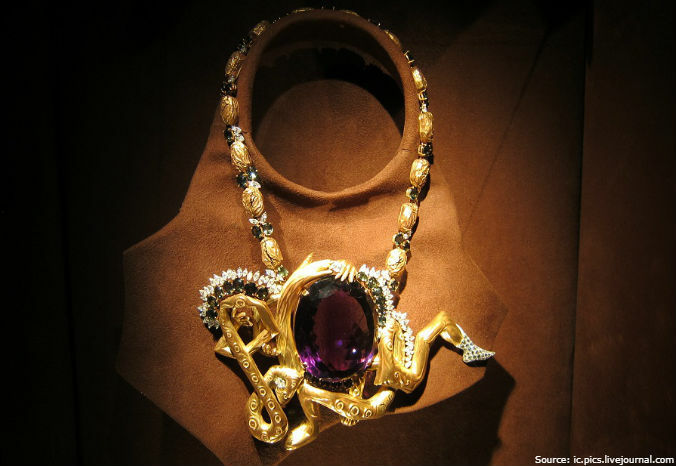 Salvador Dali adored Symbolism, so every detail in his jewelry masterpieces has a certain meaning. The "Tristan and Iseult" brooch epitomize two halves of a whole. 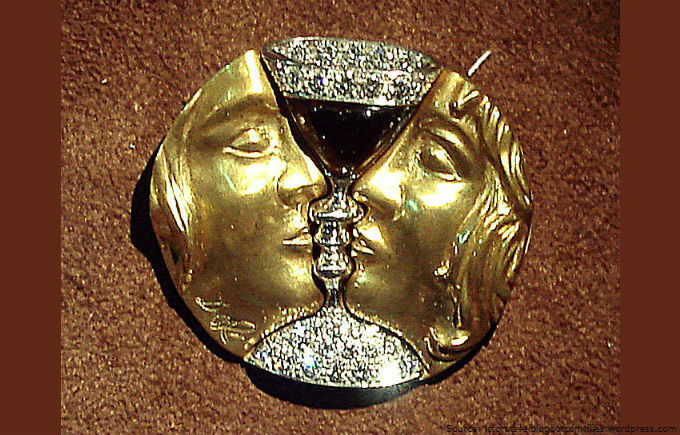 In the photo: silhouettes of lovers illustrated on the "Tristan and Iseult" brooch form a cup, which is a symbol of the abundance of feelings between a man and a woman. Materials used: 18K yellow gold, platinum, garnet, diamonds. Made in: 1953. The precious masterpiece "The Royal Heart" is a declaration of Dali’s true love to his muse Gala. The most effective decoration of Dali's jewelry collection is dedicated to the coronation of Queen Elizabeth II of Great Britain. According to the artist, rubies in the center of the piece personify the queen herself, "whose heart beats and suffers in the name of her people," and gold symbolizes the people who "take care and protect their beloved queen." Mastermind Dali ensured that the mechanism mimics the motion of the heart. It fascinates the viewers. In the video: "The Royal Heart" has a unique mechanism. Materials used: 18K yellow gold, rubies, sapphires, emeralds, garnets, diamonds, green quartz, pearls, aquamarine, amethyst. Made in: 1953. "The Space Elephant", a figment of Dali’s extraordinary imagination, is the most recognizable image in the work of this genius artist. At the request of Pope Alexander VII, a monument was built in 1667 in Rome, — an elephant that carries a large Egyptian obelisk on its back. This sculptural composition inspired Dali to create a masterpiece of jewelry art — "The Space Elephant". Long, thin and unstable legs of an elephant symbolize the fragility of a dream. In the photo: the legs of "The Space Elephant" resemble paws of grasshoppers, whom Salvador Dali feared since childhood. Materials used: 18K yellow gold, beryls, rubies, diamonds, aquamarines, watches with the Omega 440 mechanism. Made in: 1961. This Dali jewelry depicts the metamorphoses that occur with people while they’re dreaming. The artist shapes trees, branches and leaves similar to the forms of a human body. The shapes of people manifest themselves in inanimate objects, mysterious creatures and abstract images. Salvador Dali said that people can create and transform. "When human beings are asleep, they completely change, turning into flowers, plants, trees," Dali wrote. 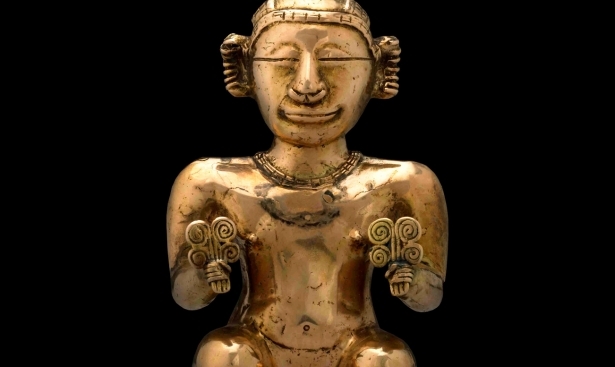 In the photo: a golden necklace made in a form of woven tree branches, alike human figures. Materials used: 18K and 16K yellow gold, amethyst, quartz, green sapphires, diamonds. Made in: 1964. 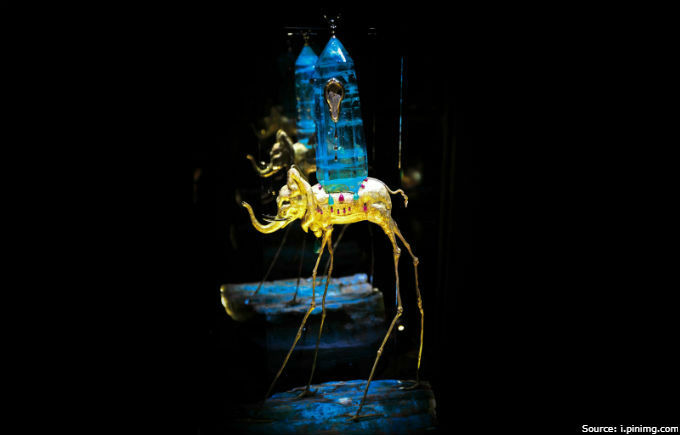 The extraordinary gold jewelry of Salvador Dali is a part of the permanent exposition in his Theatre and Museum in the Spanish city of Figueres, the birthplace of the artist. People have always admired golden jewelry and sought to increase the reserves of the precious metal. 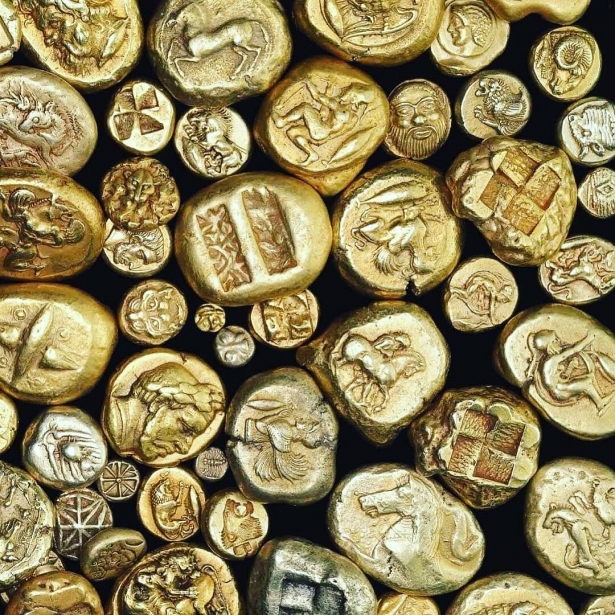 Gold bars — the foundation for investing money. Buy gold now, make sure you have financial security!